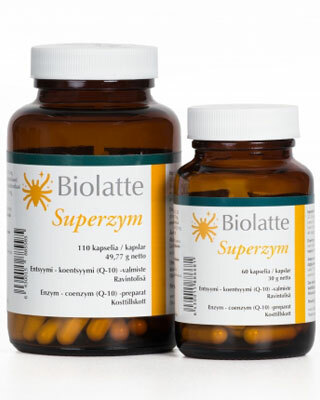 Bulking agent (microcrystalline cellulose), pullulan, lipase, co-enzyme (Q-10), lactase, α-galactosidase, phytase, α-amylase, protease, anticaking agent (magnesium stearate). 1 capsule a day with water, with meals. Do not consume medication or alcohol one hour before nor after taking the enzyme product. Lipase 80,7 u*, lactase 277 u*, α-galactosidase 166 u*, phytase 11,6 u*, α-amylase 553 u*, protease 277 u*, co-enzyme (Q-10) 2,0 mg. Sales authorisation in the EU (number AS 2251/7).